EEEgads, the November Baltimore Style Magazine is coming out and new people will be reading the Dining Dish. I'm not quite sure what Style meant saying my blog was if Lucy Ricardo wrote a blog but I will take it as a compliment. Okay, so all you new readers here is the poop on Dining Dish. I have multiple post to make but I don't seem to be getting to it. Here is the synopsis. Java Surf Cafe - 15 Village of Fenwick. They have wonderful ice cream from Woodside Farm Creamery that was written up in Gourmet or Bon Appetit's August edition. The proprietor is Jeff Goldberg. Do stop in and tell him Dining Dish sent you. a couple hours at the Maryland booth promoting tsp spices,certified organic spices conveniently premeasured and sealed in individual teaspoon packets. 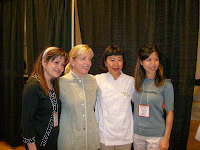 Last summer while having lunch with Hiroko Shimbo at 11 Madison in New York she asked who I suggested to be on stage with her during a cooking demonstrations. I told her to reach out to Sara Moulton who is also a member of Women Chefs and Restaurateurs and she did. Fast forward to October 1st when I day bus it to New York for the Japanese Food Show. Jamie Tiampo a fabulous food photographer and cookbook author, Julie Sahni. I wanted to give you a link to a story that Riccardo Bosio wrote about a dinner I fixed for him. Click here for the story This should keep you busy. I still have the cookbook reviews to write..that will be sent with the Dining Dish E-newsletters, archives are at http://www.dara-does-it.com. You can sign up here on the blog. 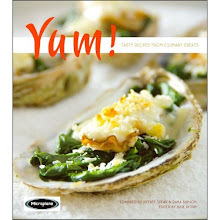 Hard to believe but the cookbook will be out October 25th. My co-compiler Jeff Spear and I will do big e-mail blast. 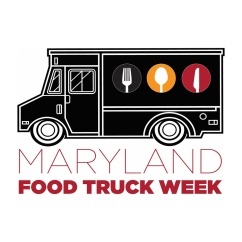 We will be at the City Lit Project fundraiser Saturday, October 25th and the Maryland Hospitality Education Foundation will be selling the book to raise money as well. More to come. WOMEN CHEFS DINNER - This Thursday in New York ...notes to come.